In Michael Paul Miller’s second solo show at the Laura Russo Gallery, he continues his exploration of the mesmerizing desolation and beauty of seemingly apocalyptic land and seascapes. 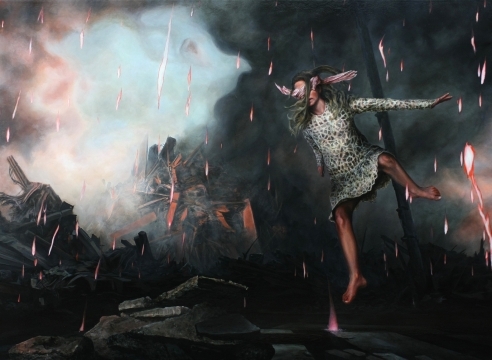 His exhibition, The Clouded Now, features large oil paintings in the tradition of grand historic tableaux, exploring visions of post apocalyptic settings of disaster and decay. A human presence is either hinted or explicit in these paintings, prompting questions about the plausibility of survival in such envisioned spaces. As a counterpoint to his larger canvases, Miller also shows a series of small works in the Empire Series, portraying plumes of smoke in a diverse range of color, verging on a symphony of abstract forms. 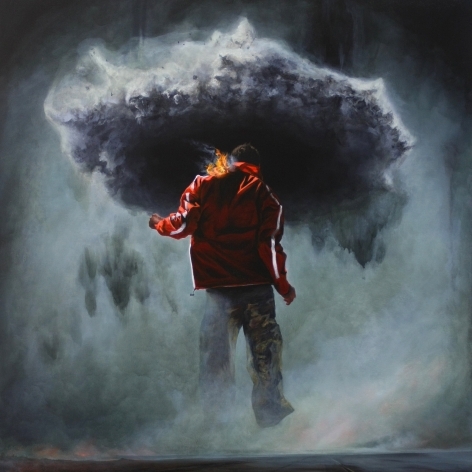 Miller’s virtuosity with his oil medium contributes to a beautiful body of work that draws the viewer into ominous scenes of environmental or human caused destruction. He observes that his work “explores the sublimity of existence through an environment emblematic of death, disaster, and desolation, without abandoning subtle indications of hope and beauty. This deconstructive setting is a harrowing and plausible circumstance that allows for an open-ended inquiry into the bewildering human condition, and enables the subject matter to address an extensive range of contemporary issues.” The painted results of his inquiry will captivate the viewer and likely raise more questions than they answer. Michael Paul Miller grew up in Wisconsin, and received his M.F.A. from the University of Wisconsin, Madison. Since 2008 he has been based in Port Angeles, Washington, where he is on the faculty of Peninsula College. He has had solo exhibitions in Washington at Lower Columbia College, Longview; the Port Angeles Fine Arts Center, Port Angeles, and the Phinney Center Art Gallery, Seattle; and was featured in 2013 at Oregon State University’s Fairbanks Gallery. He has also had one-man shows in Iowa, and Wisconsin. Miller has been included in group exhibitions at multiple college and university galleries, as well as at venues including the Coos Art Museum, Coos Bay, OR; the Seattle Art Museum Gallery, Seattle, WA; the HP Garcia Gallery in New York, among others. Coming up this spring, he will be included in the exhibition Neo Naturalists, Museum of Northwest Art, in La Conner, WA. In "The Clouded Now," Miller exhibits new paintings from distinct projects with a common underlying theme. Working on large-scale canvases, Miller pictures dystopian futures in startlingly realistic visual terms, gesturing at the incongruity of life and these environments.